'It is worth noting that the novel's last scene, with it's off-stage procession, tumultuous church-bells and climactic murder, itself resolves a very inward drama in the convention of grand opera. 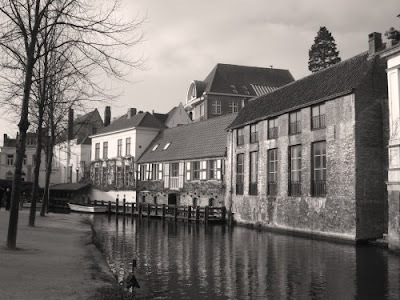 A fact not lost on the twenty-three-year-old Erich Wolfgang Korngold, whose opera Die tote Stadt (premiered simultaneously in Cologne and Hamburg in December 1920) is based indirectly on Bruges-la-Morte, and is now the form in which the novel is most widely known. Those words are from novelist Alan Hollinghurst's introduction to the new edition of Georges Rodenbach's novel Bruges-la-Morte. It is essential reading and I know many readers will disagree about the Viennese Schmaltz and say that Korngold's opera is also essential listening. Die tote Stadt is available in several versions including one from Naxos. 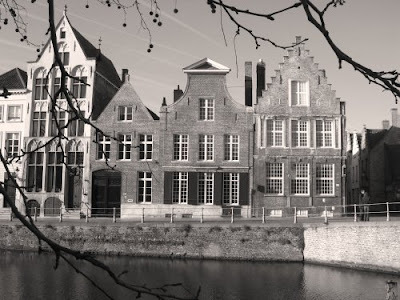 I took the photos of Bruges in February when visiting that evocative city for something well beyond Strauss modernism, the John Cage happening. Talking of Richard Strauss I will be playing the rarely heard string septet realisation of his Metamorphosen on Future Radio on May 4 as part of a programme marking the anniversary of the surrender of German forces in Europe on May 7, 1945. The main work in the programme will be the equally rarely heard Violin Concerto by Benjamin Frankel. Born in London in 1906 of Polish-Jewish parents Frankel studied in Germany and London, and his 1951 Violin Concerto is sub-titled 'In Memory of the Six Million'. Two weeks later, on May 18, I will be presenting a programme of works by musicians in exile. The music will be Bohuslav Martinů's Concertino for Piano Trio and String Orchestra, then a very rare treat in the form of Peter Paul Fuch's Five Miniatures in a performance from a private tape made available by the composer's widow and finally the String Quartet No. 5 by Fuchs' teacher Karl Weigl. It is a great privilege to be able to showcase these composers, and my thanks go to Future Radio for making it possible to bring this music to thousands of happy new ears. Metamorphosen by Richard Strauss; Serenade and Elegy by Edward Elgar; Adagio for Strings by Samuel Barber (dir.). The Smithsonian Chamber Players. BMG/deutsche harmonia mundi 05472-77343-2, 1995. The opening of the Metamorphosen almost sounds like something out of Dowland in this performance! Pliable, to make amends for my having misspelled Arthur Honegger in your comment space on Monday, I'd like to try to make amends by helping you to correct your page-bottom tracking label for Benjamin Frankel (not Frankl). Are you aware in your area of the new boook OWNING THE OLYMPICS: Narratives of the New China edited by Monroe Price and Daniel Dayan? The volume brings together a distinguished group of scholars from Chinese studies, human rights, media studies, law, and other fields. OWNING THE OLYMPICS reveals how multiple entities —including the Chinese Communist Party itself — seek to influence and control the narratives through which the Beijing Games will be understood. I love Die Tote Stadt to bits, I think it's a great opera, Strassian modernism and Viennese schmaltz and all. The Royal Opera House production in 2009 should be well sung and conducted, if the past histories of the people involved are any indication. Yikes is that Naxos recording bad! The score is cut to bits, the singing is strictly provincial level (for an opera that needs lungs that can sing Wagner well) and the sound is iffy. Much better is the RCA recording or the newly released version from Munich 1952 with Karl Friedrich and Maud Kunitz. They really have the style down. Have to make a pilgrimage, as it were, to Brugge one of these days. Garth, thanks for spotting that error. I'm afraid it is one I have made more than once as I know a Peter Frankl. Misspelling Arthur Honegger is nothing compared with the number of people who get his nationality wrong. Thanks for the tip on Owning the Olympics, I've made arrangements to obtain a copy because of your heads-up.